Without too much introduction: Legs are our pillar, support and mobility. It is extremely important to do exercises to strengthen the legs; because it will be useful for any sport or discipline. Really, It is one of the most popular and known leg exercises in the gym. The advantage of its realization is that it also works the glutes and thigh. In addition, it is a simple exercise that you can do at home (or wherever you like). It must stand with the legs separated according to the width of the shoulders. To start, it is not necessary to carry weight; over time you can add a bar (you must hold it carefully by the ends and rest it on your shoulders) or a pair of dumbbells. Keep your back straight, bend your knees and lower your glutes as if you were going to sit. They are a very good alternative for the muscles of the lower area of ​​the body to firm up and tone up. Stand up straight and hold a bar with your feet together. Keep it by the ends supporting it on the shoulders. Spread your legs laterally by flexing your knee to form an angle of 90 grams. Perform three sets of 10 repetitions per leg. Its very simple exercise that even without weights. It consists of ‘walking down’ and will be working mostly the quadriceps and glutes. Start without weight (then you can do it holding a bar or suitable dumbbell) and walk ‘squat’. You have to take long steps forward. The back leg will flex so that it will touch the floor. Take some large steps without losing your balance and maintaining your posing. Repeat with three sets of ten repetitions per legs (3 sets of 20 steps). When you are looking for exercises to strengthen the legs the elastic bands is suitable for you.Due to the versatility of the bands, there are dozens of exercises that we can do easily. You can even do the same exercises mentioned above (lunges, squats or lateral leg extension) with a small different way: You add the elastic bands and you will be resisting more resistance. Therefore the exercise will be more difficult and the result more effective. It is one of the best effective exercises to strengthen the legs. Just a little practice you will be jumping without problems. While sitting, we will lock our legs carefully behind the moving part of the machine. 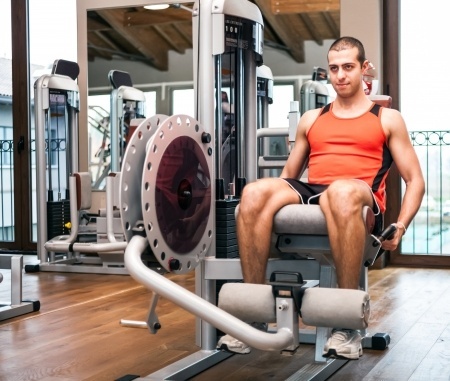 After doing strength only with the quadriceps, the moving part of the machine will begin to rise. Depending on the weight we need, we will mark it by moving a bar. Select the extension machine that will be available in the gym. Place the legs just behind the roller that will help in lifting the load. Because you will stay seated and supports your back fully. It is only the quadricepses that perform the movement. Both the up and down must be carried out with gentleness and control so that the tension increases as well as the results. It is a simple and logical operation machine. With the weight that we previously selected, we will lift it with only leg strength. 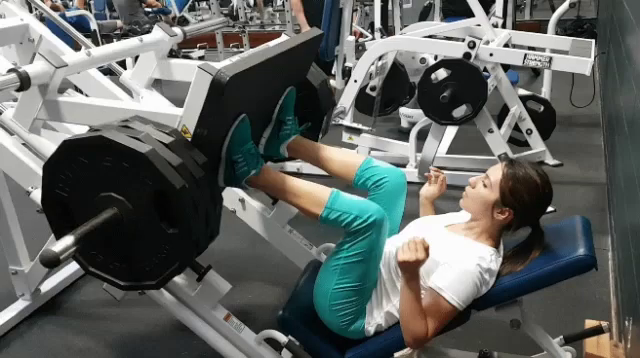 On the machine, stand in front of the press and carry your legs but separated, while your feet rest on the platform. The movement will cause the legs to be close to the chest and to move the load outwards until the legs are almost straight. Remember that you do not have to spread them completely because your knees can be injured or damaged. It is a classic exercise for hamstrings. Lying down (in some machines it is inclined/stopped) we have to strain backwards with the extended leg, flexing at knee height. The muscle that makes strength (upper back) is the hamstring. The machine of curl femoral lying down is the selected one. Lie face down on the machine and position the roller on the twins. With the above, the load will rise with the effort of the hamstrings. The movement will have to be slow and taking care of the posture, because if the load is excessive the trunk will rise and detach from the stretcher, when in fact you have to lie down. Bank with bar- Holding the weight of the bar in the upper area of ​​the body, one leg is raised to a bench, the next rises to be at bench height and the same process is repeated to return to ground level. If it’s very easy, add balanced weight to the bar. Go up to the bench with a bar– In each hand, weights are loaded and you go up at first with one leg to the bench, then with the other to stand with both on the bench and the same sequence is lowered again. Squat with bar – The bar will be used in this case as dead weight which is to increase the strength of the exercise. Remember that the knees should not pay for the imaginary line that is drawn with the shoulders and the tip of the feet. Front squat with bench – The exercise requires that a bar be used as a deadlift, repeat the same steps as a traditional squat, but in this case you sit in a bench as you fulfill the movement. The intensity will be achieved by having to get up again from the back. It is very similar to bar squats, the difference is that you will have more room and more freedom of movement (not being a single bar, you can move better); the squat is usually deeper and the results more efficient. You should start by standing up and holding a dumbbell with both hands, so that the weight is shared between them. It is very important that the dumbbell is right in front of the thighs. Proceed down with your body while bending your knees until you get a 90 degree angle. Elevate yourself by going upwards after completing a pause that opens. It is essential that the body remains firm throughout the movement. The name says it, they are the traditional lunges (or strides), but now “the step is for backwards”. In addition to strength, you will need coordination. The posing to start with the exercise consists of standing and sub-leader of a dumbbell in each hand and on the sides of the body. Pay attention that the palms are pointing to the body. It is key that you do it. Now I put one foot back and bend your knees so that the body can be carried down until you notice that the knees can form a 90 degree angle. After completing a pause that is very brief, you can elevate the body towards yourself. The trunk will have to stand firm during the completion of the entire movement. 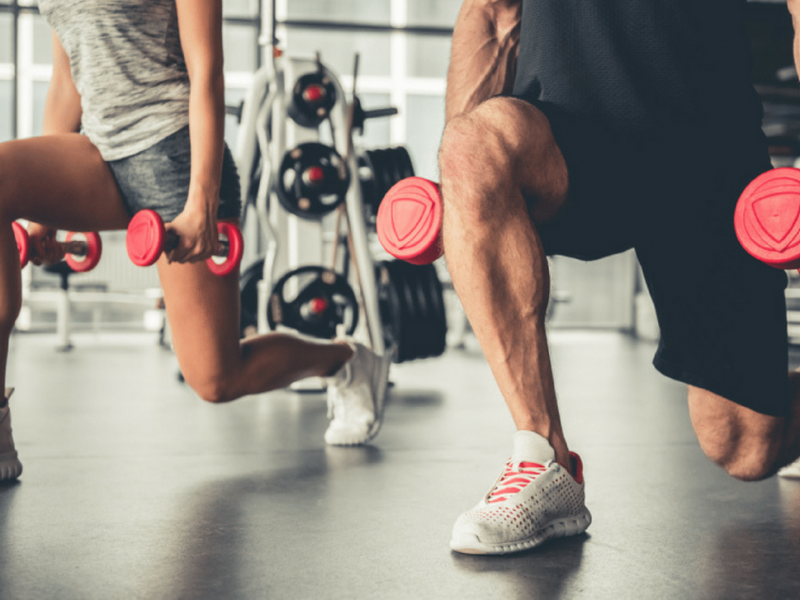 The primary posing for this dumbbell leg exercise has to do with standing up and holding a dumbbell with each of your hands, while he places them against each side of the body. The palms will have to point towards each other for which the initial position is correct. Next you will have to take a wide step towards one of the sides, looking for that with the above the knee can show an angle of 90 degrees. Very slowly and calmly, return to the starting position after completing a brief pause. Keep your back very straight at all times so that the movement is adequate. It is an exercise for dumbbell legs very effective and demanding. Stand up and hold a dumbbell with each of your hands and making sure they are on the sides of your body. In relation to the palms, they will have to be pointing towards each other. Lower the dumbbells by bending your hips forward and lifting yourself back up after completing a brief pause. The back should stay straight during the movement.